Thursday Doors is a weekly feature, hosted by Norm 2.0 allowing door lovers to come together to admire and share their favorite door photos from around the world. 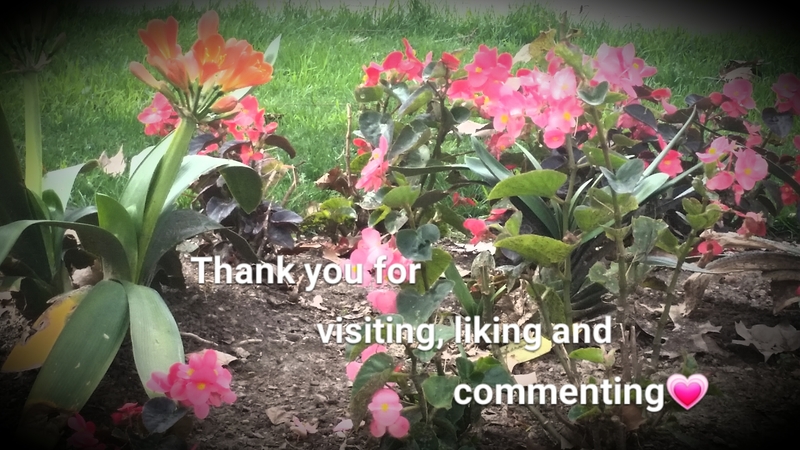 Everyone is invited to join in on the fun by creating their own Thursday Doors post each week and then sharing it, between Thursday morning and Saturday noon (North American eastern time), by using the blue link-up button on Norm’s blog. 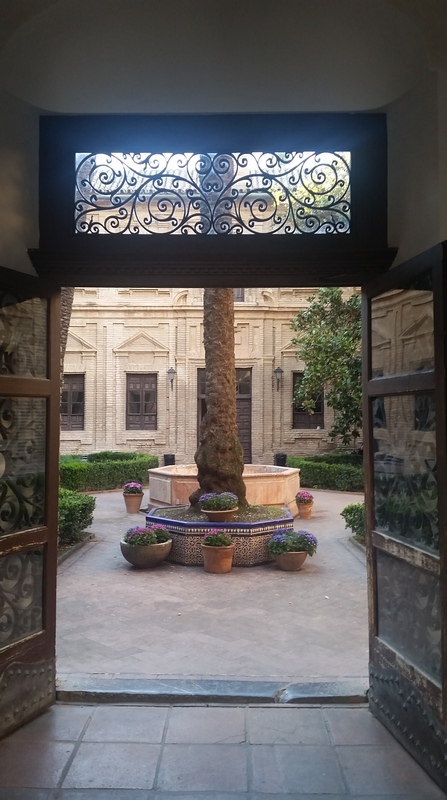 Today I’m going to show you another door or two which I walked through several times a week for five years, The Faculty Of Philosophy and Arts in Cordoba, Spain. 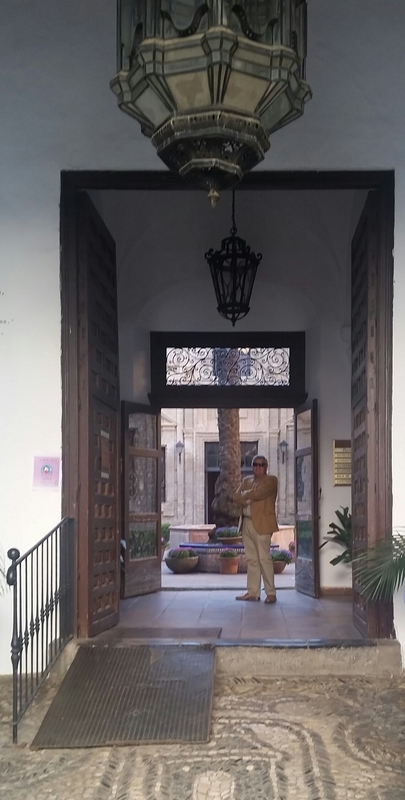 This is the main door of the Faculty of Philosophy and Arts, in Cordoba, where I read my doctoral thesis on language learning strategies, over ten years ago. It’s also the place where I worked as Associate Professor of English for five years. I taught English language and linguistics as well as Medieval, Renaissance, and Postcolonial English Literature to undergraduate students, and Teaching Methodology and Didactics on Postgraduate students preparing their Master’s dissertation. I loved teaching here, because my students were enthusiastic and motivated, and because it’s a very special building, with a great deal of history embedded within its mysterious stone walls. It’s not surprising that many of the students and people who work here have sensed that they sometimes were not alone in empty classrooms or shadowy corridors. Here’s the open main door and the patio straight ahead. The building has two floors. The lower floor has two patios, the main one, which can be seen in the photograph I took a few days ago, is an enclosed patio, which is very typical of the stately homes of the old town. There is another, smaller patio to the left, which leads to the chapel, and the old mortuary, which were curiously side by side. Did I say mortuary? A little bit of history before we continue our look at the doors in the building. 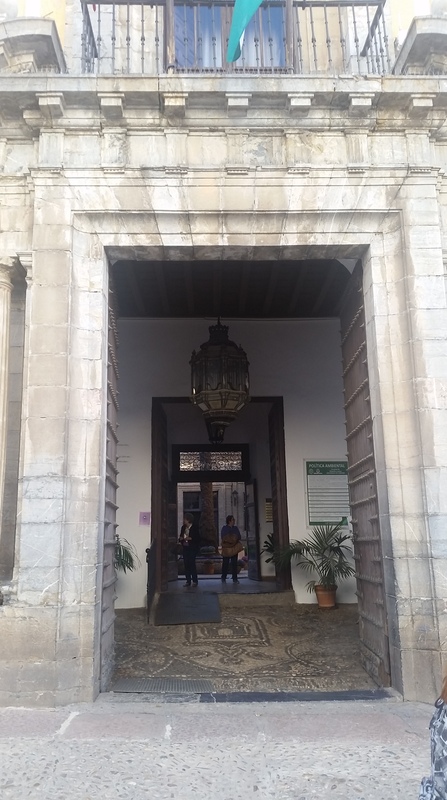 It became part of the University of Córdoba in 1970, but let’s have a quick look at what happened between 1701 and 1970, which may explain why some think it’s haunted. 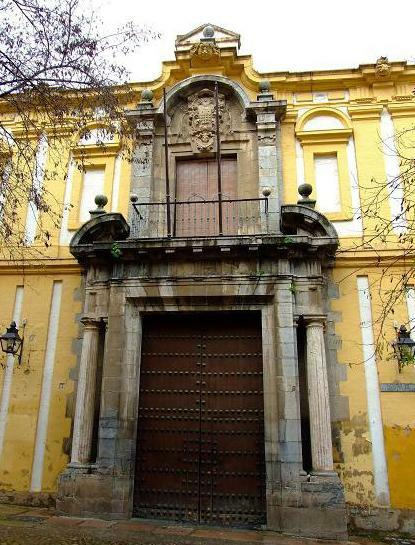 En 1701 Cardinal Pedro de Salazar, bought some land near the Cathedral in Cordoba, which was built inside a Mosque, but more about that next week. His first intention was to build a school, probably a boarding school, for the cathedral choir boys, so the plans were made and construction was soon started. In 1704, when the building had not yet been finished, there was a devastating epidemic in Cordoba and the Cardenal was convinced that it would be more beneficial for the town if a hospital was built instead of a school. That’s why this stately, baroque building looks more like a palace than a hospital. It became a hospital well afer the building plans had been made. 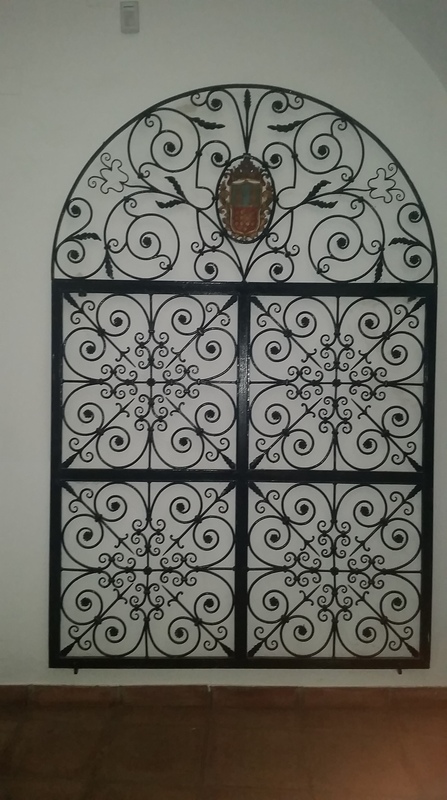 Above is the original iron gate which was part of the chapel. 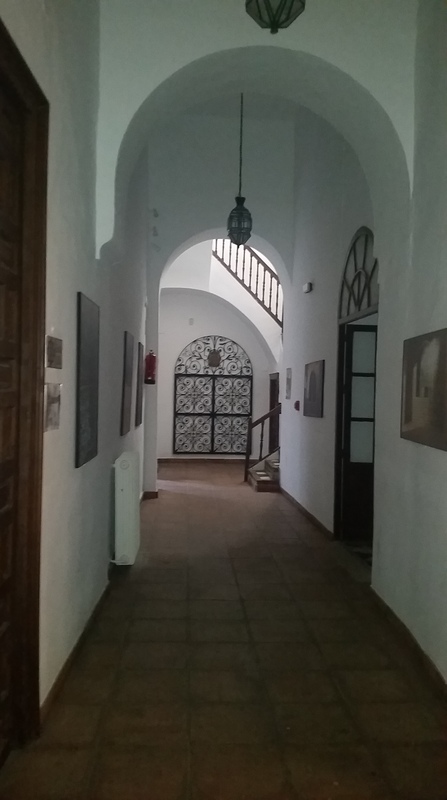 Below we can see it at the end of the corridor, and on the right is classroom 1, the spookiest because it used to be the mortuary, and to the right of the gate, just past a small winding staircase, is the chapel. 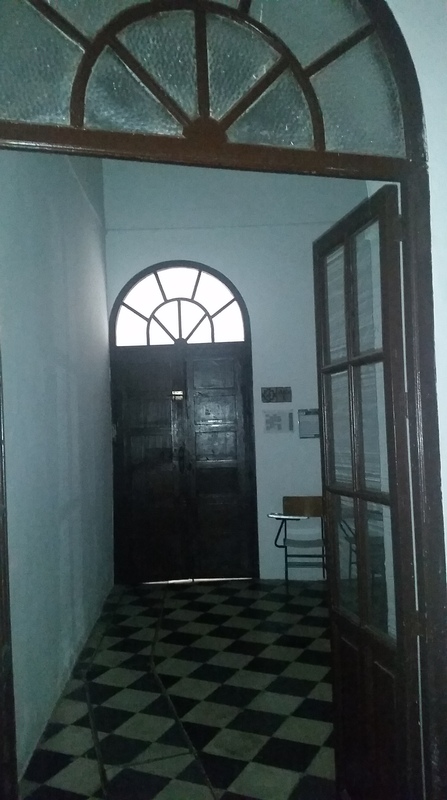 Below is the door to classroom number 1 (the open door to the right in the picture above), the old mortuary. The rails on the floor were to wheel in the trolleys with the dead bodies. Many say it’s haunted. I never saw or heard anything specific, but I smelt sickening odours and saw unexplainable shadows on occasions, not to mention some spine chilling moments when I left the solitary building after nine in the evening. There is a wide staircase between the two patios leading to the to floor, where most of the patients’ wards and rooms were situated. 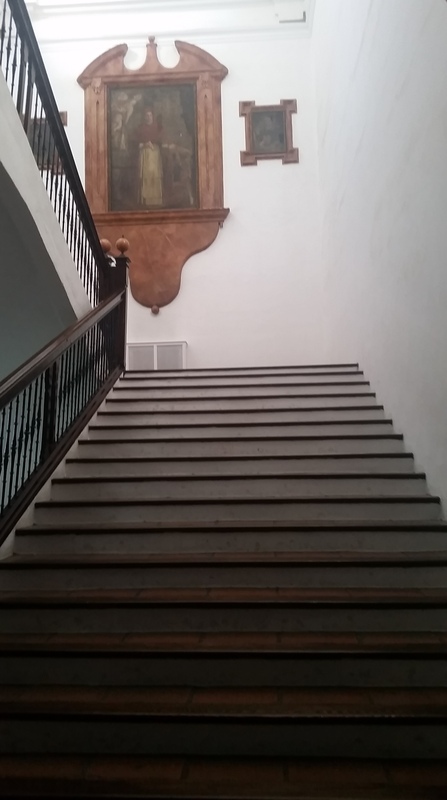 There’s a giant painting of Cardenal Salazar at the top of the first flight of stairs, on the first landing, which you can see in the picture below. So, did you like today’s haunted doors? Are there any haunted buildings where you live? 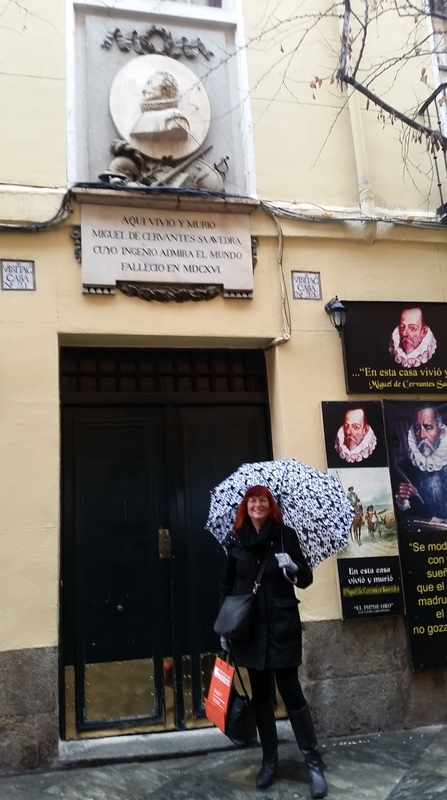 During a recent study visit to Madrid, with my adult ESL students, I was fortunate enough to stand beside a door through which Miguel de Cervantes entered daily. Well, that’s not strictly true, because the building itself, as most of the buildings in the area were refurbished or rebuilt in the early 19th century. 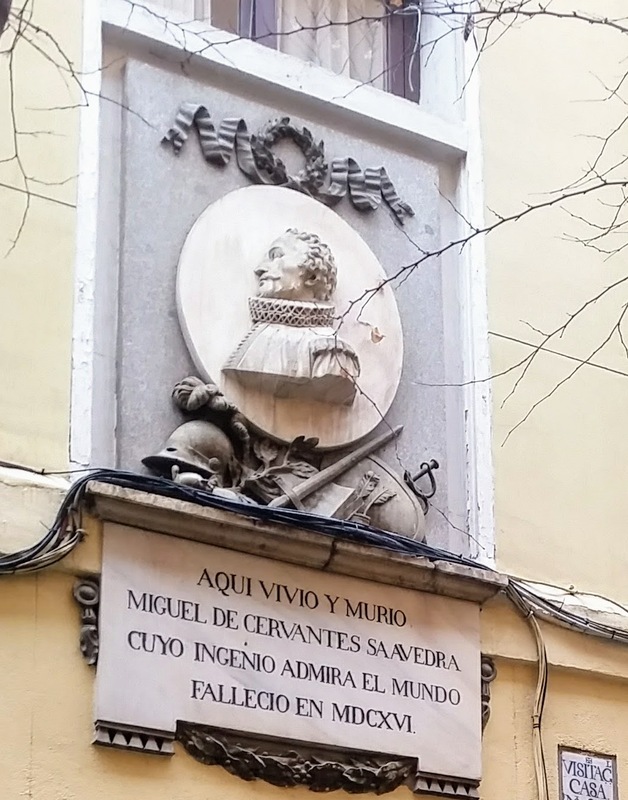 The street is now called Calle de Cervantes and there is a bust, because this is the house where he is believed to have lived and died. Here I am standing outside the door. The house of the playwright Lope de Vega is in the same street, Calle Cervantes, which you can see at the top. Here I am standing by Lope’s House. Here’s a close up of Cervantes’ bust, over the door. Here’s a reconstruction of Lope’s study. Here’s a close up of the door to the left of the study. None of these doors or places are the ones the authors actually used, which is a pity, but almost four hunderd years on, we can’t expect to see and touch the original. I had to close my eyes and imagine Cervantes and Lope walking along these streets, thinking up new ideas for plays, novels and short stories. That was easy to do. Miguel de Cervantes’ biography is almost as elusive as Shakespeare’s. There are many disputed facts about basic aspects of his life and activities. It is believed he was born in Alcala de Henares, a small town very near the capital of Spain in the year on the 29th of September, 1547, although not everyone agrees on the exact date. 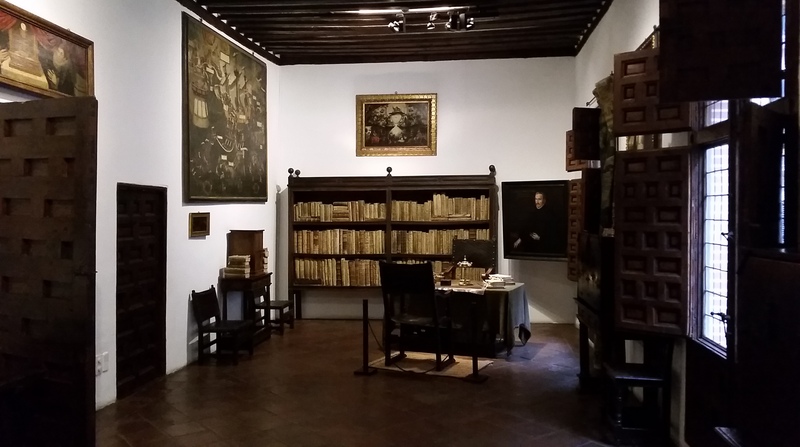 The situation of the exact house where he was born is also disputed, although there is a museum in Alcalá de Henares, which is meant to be a replica of the original house. A lot more is known about his time in Madrid as an adult. He rented various houses in the quarter known as ‘Barrio de las Letras’ or District of the Arts (also known as District of Letters, but I prefer the former name), because many writers and artists lived there, especially in the 16th and 17th centuries. 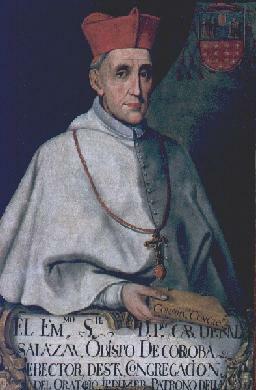 The Spanish Renaissance has been named as the Golden Age of Spanish Literature and Art (El Siglo de Oro), during which time the arts in general, especially literature and fine art flourished, with painters such as, Velázquez, Zurbarán and Murillo, and writers such as Cervantes, Quevedo, Lope de Vega and Gongora. It is believed that when he died, his body was buried around the corner at the Convent Trinitaras, which is marked by another plaque. 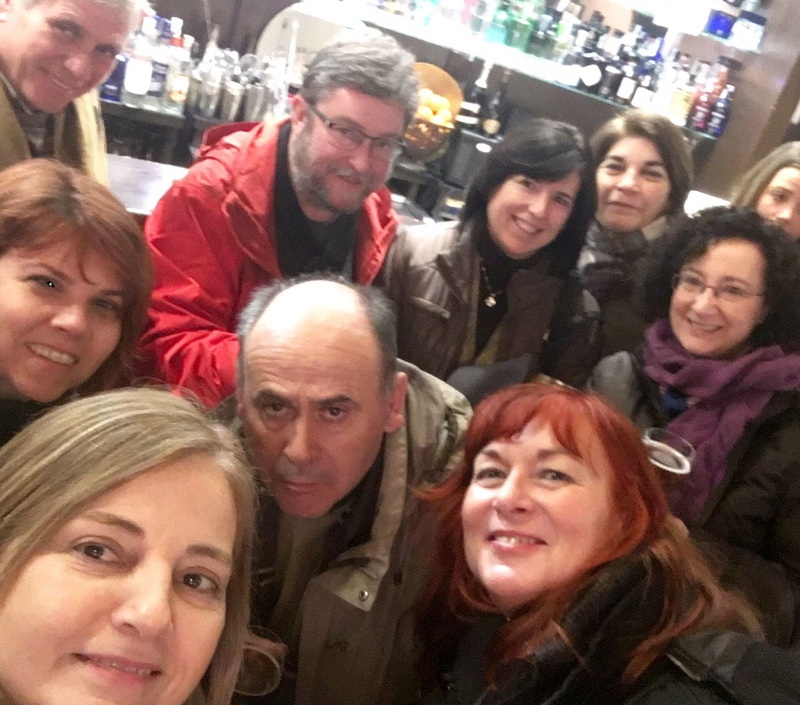 El Barrio de las Letras is a very lively and bohemian part of Madrid, with narrow and mostly pedestrian streets and famous squares such as La Plaza de Santa Anna with many shops, bars and restaurants. After the visit we stopped to have a drink and some tapas for lunch at a nearby bar, of course. It’s hard being a teacher on a school trip! I hope you enjoyed these Madrid doors! What a great house to visit. It’s funny to see an umbrella and warm jackets in Madrid, the last time I was there it was during a heat wave and I was melting, lol. Thank you. This was a few weeks ago in February. What beautiful doors and their history. When I visited churches and museums in Italy and Germany, and walked the brick streets and alleys that are all about history, I felt the presence of those that came long before. It’s eerie and humbling. Thank you Brenda💖 So glad you liked the photos.